Sterling Bay, the developer of a proposed state-of-the-art sports and entertainment stadium in Chicago, has bought a United Soccer League (USL) franchise. The venue could form part of e-commerce company Amazon’s new headquarters in the US city under plans proposed by the property developer. Sterling Bay is hoping to make Chicago the site for Amazon’s second headquarters, and has composed ambitious designs as part of its submission to the company. Sterling Bay managing principal Andy Gloor said that the goal is to have the USL team playing in its planned stadium along the Chicago River by the 2020 season. Sterling Bay and other investors will own and operate the USL team, Gloor said. The USL is the second tier of US professional football, with Major League Soccer serving as the top league. Chicago Fire is the city’s MLS representative based in the southwest suburban area of Bridgeview. 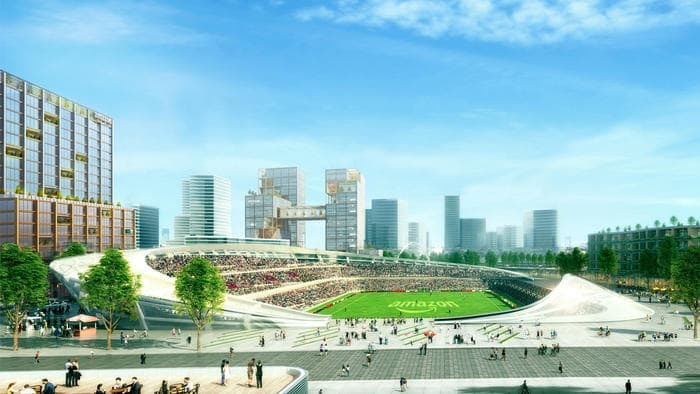 The proposed stadium is still some way from becoming a reality, with the Tribune noting that Amazon, which is currently based in Seattle, has received bids from 238 cities and regions across North America hoping to be the site for a second campus. A decision for the new headquarters, which is set to create up to 50,000 jobs, is due next year. “This transformative project will include a state-of-the-art stadium that will become a valuable community asset where downtown Chicagoans can enjoy professional soccer and other live events,” said USL chief executive Alec Papadakis in a statement provided to the Tribune by Sterling Bay.